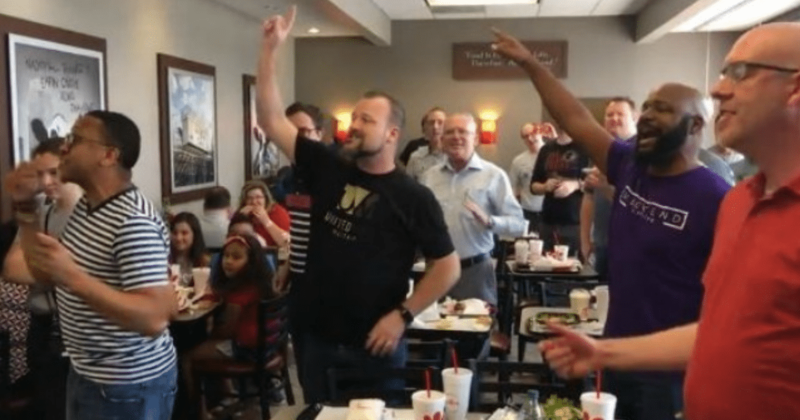 Imagine just eating your food at Chick-Fil-A, and all of a sudden, a flash mob comes in and starts singing. That’s exactly what happened recently in Atlanta. Diners were just eating their meals, and all of a sudden, they were treated to a free show. An a Capella group was in Nashville for a religious conference when members chose to surprise the diners. The lyrics repeat four times, and then the song ends. It’s a beautiful song that is fun to sing and brings people closer together. It’s perfect for an a Capella choir to perform, and everyone inside the restaurant seemed to enjoy it, too. The flash mob consisted of more than 60 singers. They are all from different parts of the world, but they share a couple of things in common. They are passionate about their religion, and they love to sing. They were feeling great that day and wanted to share their love of the Lord with everyone around them. They weren’t sure how everyone would act, but it went in their favor. The singers continued to sing before grabbing their lunch and heading back out. Where did they go? Did they move on to another conference? Did they have another show to put on, or did they travel to the next restaurant to entertain those guests, as well? As for Armstead, he would like to see more of the flash mobs popping up. He was glad that he got to witness the amazing event, and he saw how happy it made the diners. Anytime a group of people can come together to make another group of strangers happy and change their day, it’s a good thing. We need more people like this in the world. Maybe this story will inspire others to go out and do something nice for people they don’t know. It doesn’t cost anything to be nice, and sometimes, the smallest gestures can make an enormous difference.